Nearly 1,100 students earned their post-secondary credential from the state’s newest public University in 2015-16, and about 520 of them will walk across the stage at Middle Georgia State University's three spring commencement ceremonies, scheduled over two days - Wednesday, May 11, and Thursday, May 12. Speakers for this year’s ceremonies include notable business and civic leaders from the fields of healthcare, media and business. 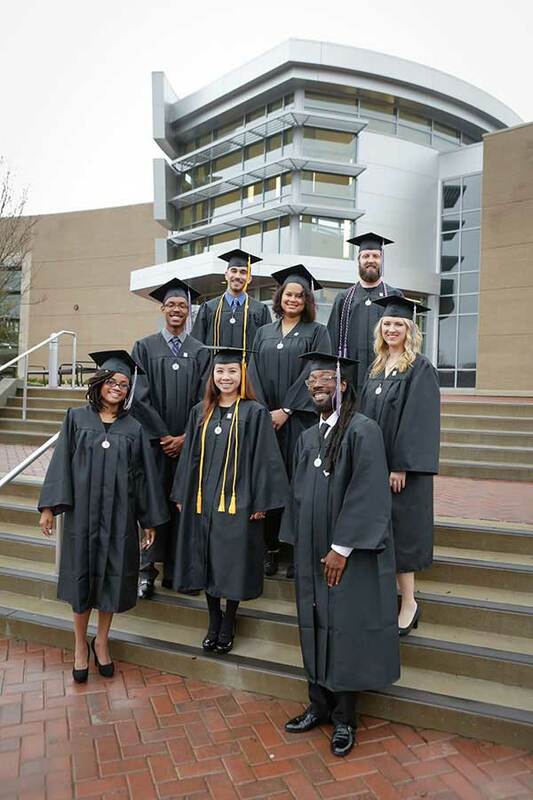 Dr. Ninfa Saunders, CEO of Navicent Health, will address approximately 170 graduates participating in the first ceremony, which begins at 3 p.m. Wednesday, May 11, for the School of Health Sciences. These new members of the healing professions will have received their pins earlier that day. Teya Ryan, CEO of Georgia Public Broadcasting, will address nearly 190 graduates participating in the second ceremony, scheduled to begin at 10 a.m. Thursday, May 12, for the College of Arts & Sciences and the Georgia Academy of Arts, Mathematics, Engineering & Sciences, the University’s residential dual-enrollment program for high-achieving high school students. Chris Clark, CEO of the Georgia Chamber of Commerce, will address nearly 160 graduates participating in the ceremony at 3 p.m. Thursday, May 12 for the Schools of Aviation, Business, Education and Information Technology. Graduate Kylie E. Mims Snow, the 2016 President's Scholar, will be the student speaker at the three ceremonies. And, graduates will also be welcomed into the Middle Georgia State University Alumni Association. All three ceremonies will take place at the University’s new state-of-the-art Recreation and Wellness Center on the Macon Campus, 100 University Parkway. The wellness center will be closed to the public the week of May 9 for preparations. In what will be the start of a new tradition, candidates for graduation will, weather permitting, march across the bridge spanning the campus lake as they make their way to the Recreation and Wellness Center. Faculty will greet the students as they walk by. Live streaming of all ceremonies will be available at www.mga.edu/live. For those attending in person, directions and a campus map are at www.mga.edu/about/maps. The CEO of Navicent Health, Dr. Ninfa M. Saunders is a consummate professional whose vision for healthcare is only rivaled by her passion for the people and community that she serves. For more than 42 years she has been a major figure in driving excellence, innovation and transformation in many organizations, associations and communities. Dr. Saunders received her doctorate in Health Administration from the Medical University of South Carolina, where she graduated with the highest honors and was recognized as a distinguished alumnus two years after completing the program. She was one of the first nurses to be accepted and graduated from Emory University’s Executive MBA program in 1984. She received her Master of Science in Nursing from Rutgers University and her undergraduate degree in Nursing from Concordia College. In recognition of her leadership, she was named Middle Georgia’s Person of the Year by “The Telegraph” in 2014. In the same year, she was recognized by “Georgia Trend” as one of the state’s 100 Most Influential Georgians. Her resolve to make a critical difference extends beyond the region. Her national presence and leadership is equally noteworthy. Dr. Saunders is chair of the board for the Institute for Diversity. She is a member of the American Hospital Association’s Task Force on Vulnerable Communities. She has been invited and accepted to the Healthcare Executive Study Society. Saunders is also a professor at Mercer University’s School of Medicine. Teya Ryan, CEO and president of Georgia Public Broadcasting, is a 30-year broadcast media veteran whose passion for storytelling, curiosity for the world around her and innovative ideas have earned her leadership roles at venerable broadcast operations. Ryan formerly served as executive vice president and general manager of CNN/US, where she was in charge of all network programming, daily editorial, breaking news and on-air graphic and new program development. She also helped to develop a cross-platform sales initiative that increased CNN ad sales by $65 million. Ryan has also generated a series of television “firsts,” including “Talk Back Live,” the first daily live talk show to incorporate interaction via the Internet. While working jointly for CNN and TBS, Ryan served as the executive producer for “Network Earth,” the first weekly environmental magazine series. In 2012, under her leadership, GPB Media received the Southeast Regional Emmy for Station Excellence. She also received a Womenetics 2012 POW! Award for business innovation. Additionally, Ryan has won seven Emmys, four Cable Ace Awards and she was named one of the ten most powerful women in media by Crain Media in 2002. Her civic roles include serving as a board member for Oxfam America and serving as a vice president and founding member of The Society for Environmental Journalists. A Georgia native, Chris Clark, is the president and CEO of the Georgia Chamber of Commerce. He received his bachelor’s degree from Georgia Southern University and his master’s degree in Public Administration from Georgia College and State University. Prior to joining the Georgia Chamber, Clark served as commissioner of the Georgia Department of Natural Resources and as deputy commissioner for the Department of Economic Development. Before his state service he was the president of the Fayette County Development Authority and CEO of the Hawkinsville-Pulaski County Chamber of Commerce. Clark serves on the board of directors for Council of State Chambers and sits on the boards of the Georgia Allies and the Georgia Association of Chamber of Commerce Executives. He is also a member of the U.S. Chamber of Commerce’s Council of 100 and the Political Affairs Committee.Clark is a trustee of Georgia Southern University and a member of the board of visitors for the University of Georgia. He is a graduate of Leadership Georgia and has been consistently named one of “Georgia Trend” magazine’s 100 most influential Georgians and one of the “Atlanta Business Chronicle’s” most influential Atlantans. He received the Georgia Economic Developers Association's Zell Miller Public Policy Leadership Award. Clark also serves on the board of directors for the Real Life Center, a Christian outreach program that provides food, clothing, financial assistance and educational classes for those in need. Kylie E. Mims Snow of Macon, who recently completed her Bachelor of Science in Psychology, is the 2016 President’s Scholar, the highest award Middle Georgia State gives to a graduating senior. The President’s Scholar must have an outstanding academic record, significant campus/community involvement and demonstrate characteristics indicating the promise of a successful future. In the rigorous bio-psychology degree program, Snow earned the highest GPA among more than 250 graduates in the program’s four year history. Because of her academic excellence, she was personally invited to become Middle Georgia State University’s first undergraduate teaching assistant. She also conducted undergraduate research and has given several state and regional level presentations at honors conferences, which prepared her well for the graduate program in Forensic Psychology she will begin this fall.